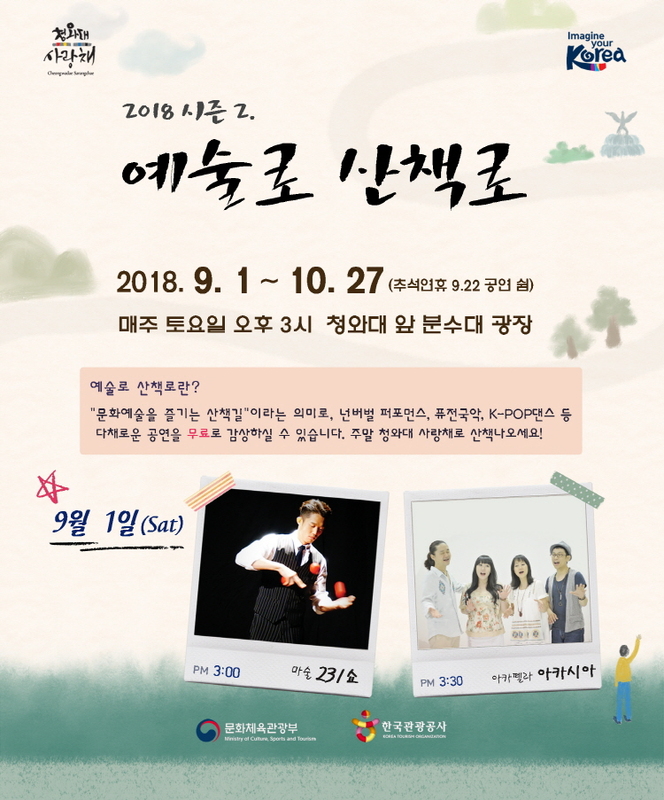 지난 5~6월 <2018 예술로 산책로 시즌1.> 이어서 <2018 예술로 산책로 시즌2.>가 더욱 새롭게 찾아옵니다. 9월 1일 토요일, 오후3시부터 행복한 순간을 전하는 마술 231쇼, 목소리로 멜로디와 반주를 만들어 내는 아카펠라 그룹 아카시아의 무대로 <2018 예술로 산책로 시즌2.> 첫 공연을 합니다. 누구나 무료로 관람할 수 있는 청와대 사랑채 앞, 청와대 분수대 광장으로 토요일에 산책 하시는 건 어떨까요? ★ <2018 예술로 산책로 시즌2.>는 9월 1일부터 10월 27일(단, 9월 22일 제외)까지 이어집니다. returns anew after the successful runs of Promenade of Art 2018 in May and June. Kicking off at 3pm on Saturday, September 1 is the “Magic 231 Show” that brings moments of happiness. This will be followed by a live acapella performance by the group Acacia. Come September, Season 2 of “2018 Promenade of Art” returns with more culture and art, every Saturday from September 1 until October 27 (except September 22).